Window sills made from natural stone are an excellent investment for homeowners and commercial property owners. 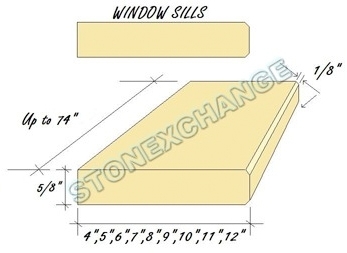 The cost of installing these beautiful stone sills is actually the same as when wood or composite material is used. Best of all, the price of marble window sills is within the reach of most everyone, thanks to the direct import/distribution service provided by Stonexchange. Our company works directly with overseas quarrying and fabrication companies, and we import bulk shipments of some of the world’s finest natural stone. Our specialty is window sills, and we carry a full line of the popular crema shade material in all of the most commonly used lengths and widths. Crema shades are beige, meaning that this shade blends very nicely with other neutral tones used for interior decorating and accenting. Cream or beige tones are often used for flooring tiles, and the complementing window sills becomes one of the primary accent colors in the room. Our Crema Sahara Marfil is a great match for building plans specifying Botticcino or Bursa shades. When expertly polished, Crema Sahara Marfil is lustrous and smooth. The veins stand out nicely from the cream color of the stone, giving the impression of an expensive, elegant, and stately accent to the indoor environment. This shade of marble is very much in demand in the United States and elsewhere, and because of the bulk import service available from Stonexchange, this material is now more affordable than ever before. Building plans often call for a cream shaded window sill with a high polish. The instructions may also specify the use of a single bevel, double bevel, or Hollywood style sill design. We carry both the standard sill – with squared corners – and the popular curbs and thresholds that have single or double bevels on the long sides. The curbs and thresholds can be used as floor saddles, shower barriers, and even custom sills. 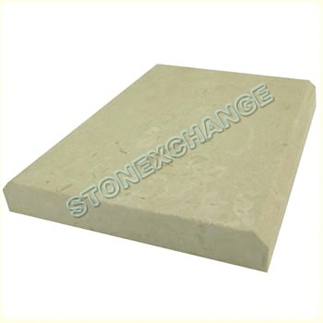 Natural stone is a wonderful material for use as a sill because of its durability. When properly installed, it works as a water-tight barrier against moisture intrusion from the outdoor environment. It does not chip or crack, does not fade over time, and helps to maintain the structural integrity of the entire window frame. One of the common problems with wood sills is their tendency to bow or expand when subjected to extreme temperature or humidity changes. This eventually allows water to seep into the sheetrock from outside. This most commonly occurs when the window frame begins to slowly buckle as a result of structural settling. Replacement can be costly, as expensive as the original installation process. It makes financial sense to use a material that will not expand, crack, or buckle. Natural marble stone is the obvious choice for making sure a window frame remains weather-tight and sealed. The primary reason that cream shaded marble is so popular as a sill material is because its medium shade blends perfectly with both light and dark colors of furniture, wall accents, and decorations. If the walls themselves are white or near-white, the sills and flooring tiles act as a shade stepping stone between the light walls and the darker furniture. When Crema Sahara Marfil is given a high-quality polish, the look is one of total opulence. The popular color choices for window dressings are white, off-white, or dark. Once again, this color complementing with the wall color and the shade of the marble sill is quite positive when crema is used as the sill material. The visual effect is quite striking when the same material is used for floor tiles and for thresholds separating the marble from carpet or hardwood. Window sills extend beyond the width of the window frame, meaning that the lower frame can support the weight of the sill even though the marble itself cuts into the adjoining sheetrock. Considering the standard widths of today’s window frames, the popular lengths of marble sills are 37-inch, 60-inch, and 74-inch. Stonexchange carries all three of these lengths, and our standard sills are 5/8-inch in thickness. Our 37-inch sills are available in 5-inch and 6-inch width. These same widths are available on our 60-inch lengths sills as well. Our longer 74-inch length sills come in widths ranging from 5-inch to 10-inch. These marble sills are thinned from larger, thicker slabs of granite, cut into appropriate sized stripes, and given a high-quality polish. This procedure is completed at an overseas manufacturing facility. The finished sills are packed into large ocean freight containers and sent to our Florida-based distribution center. As many as 40-50 full containers of marble sills occupy our warehouse at any given moment. We ship full crates of sills to area retailers, construction companies, and outlet supply chains. Larger containers filled with hundreds of pieces of material are often ordered by contractors requiring a large amount of marble for an entire residential or commercial complex. Wholesale pricing on bulk delivery of fine-quality Crema Marfil window sills is what we at Stonexchange are all about. In addition to our unbeatable per-piece material cost, we offer rapid overland shipping to all destinations in the continental United States. Our large inventory means prompt filling of orders. Home improvement centers, flooring product retailers, and private installation companies benefit from using a direct importer of marble products because full crate loads can be sent on a moment’s notice. Order processing generally takes only a few days, and our in-house quality assurance teams personally inspect each order before it leaves our distribution facility. Cost estimates given upon receipt of order request allow for minimal breakage because our shipping procedure guarantees against an inordinate amount of damage. Our overland freight partners give us a break on shipping costs because we are constantly sending product to destinations across the country. We pass this savings on to our customers. The per-piece cost of obtaining fine-quality Crema Marfil window sills has never been lower. Construction companies benefit from ordering in full crates because development of a new residential or commercial property is often divided into stages, with the budgeting for material purchase likewise divided into segments. Reordering the same product several times over a period of six months or a year is never a problem because we maintain a full inventory throughout the calendar year. Non-standard size window sills can be fabricated by our manufacturing partners overseas. This generally requires a lead time of two or three months, but the per-piece cost of these shipments is the same as for our standard size window sills and thresholds. Mixed orders containing requests for matching sills and thresholds are also processed at the same per-piece cost as our standard full-crate, single material type orders. This makes it possible for even the smaller contractors and retail flooring/interior merchants to obtain top-quality Crema Marfil window sills made from beautiful, natural marble at a cost far below what many competitors offer. Another advantage of ordering full crates of marble sills is the ability to separate the pieces according to their individual textures and patterns, making it easy to find the perfect match to accompanying floor tiles or thresholds. Getting the correct match between sills and floor tiles is important and large orders means an assurance that excellent matches will be found when it comes time to finish an interior unit. Stonexchange is in business to supply commercial clients with the finest quality marble sills, thresholds, and curbs at fantastically low prices. We are a wholesaler dedicated to providing beautiful polished marble on a timely basis, whether it be a one-time order or a continuous restocking of material required by merchants. Feel free to contact us for accurate pricing and shipping information on full crates or large containers of Crema Marfil window sills made from exceptional quality natural marble stone.